ONOS measurement based control describes how real-time streaming telemetry can be used to automatically trigger SDN controller actions. The article uses DDoS mitigation as an example. 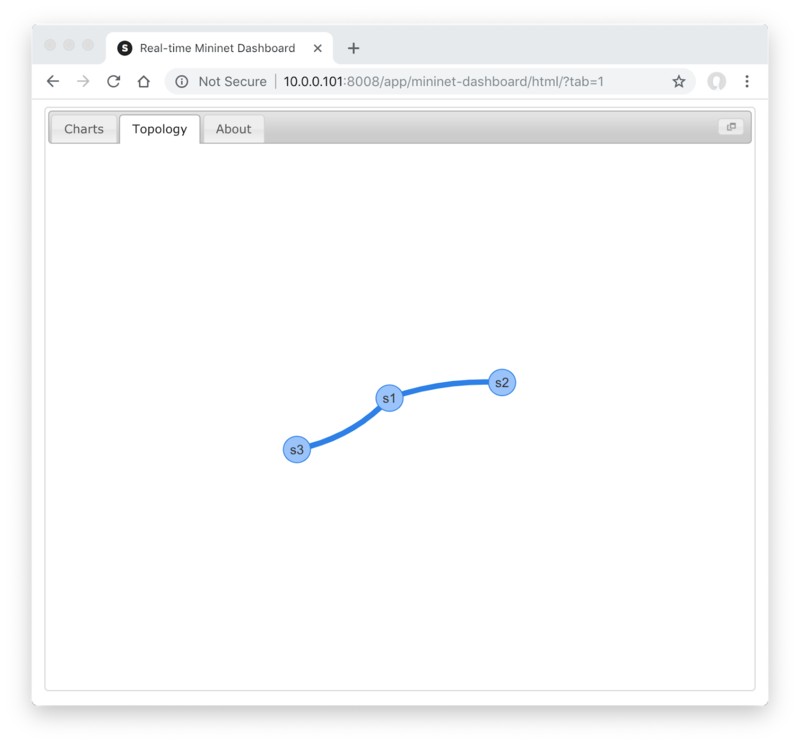 This article recreates the demonstration using the Ryu SDN framework and emulating a network using Mininet. Install both pieces of software on a Linux server or virtual machine in order to follow this example. Note: The simple_switch_13.py and ofctl_rest.py scripts are part of a standard Ryu installation. The $RYU_APP variable has been set to point to the Ryu app directory. This demonstration uses the sFlow-RT real-time analytics engine to process standard sFlow streaming telemetry from the network switches. The weathermap view shows the flow crossing the network from switch s2 to s3 via s1. The chart at the top of this article shows the iperf test followed by the simulated attack. The top chart shows the top flows entering the network, showing the DNS amplification attack traffic in blue. The middle chart shows traffic broken out by switch port. Here, the blue line shows the attack traffic arriving at switch s2 port s2-eth1 while the red line shows that only a small amount of traffic is forwarded to switch s3 port s3-eth3 before the attack is blocked at switch s2 by the controller. 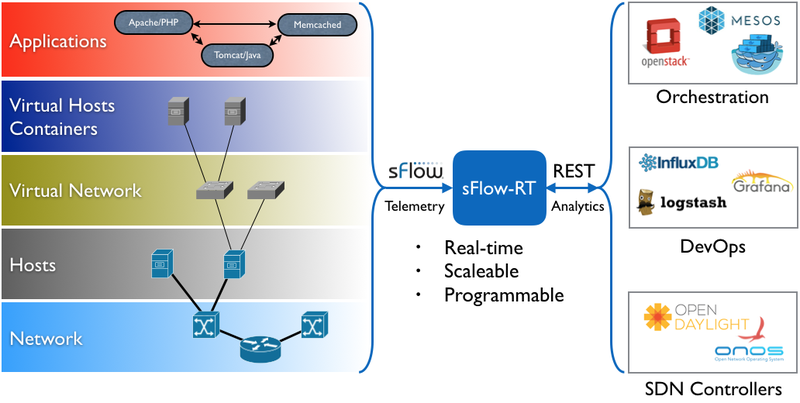 Mininet with Ryu and sFlow-RT is a great way to rapidly develop and test SDN applications, avoiding the time and expense involved in setting up a physical network. The application is easily moved from the Mininet virtual network to a physical network since it is based on the same industry standard sFlow telemetry generated by physical switches. 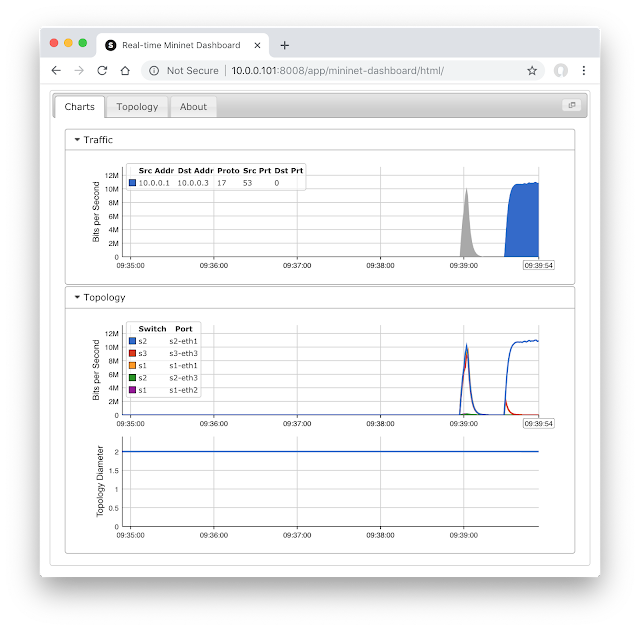 In this case, using commodity switch hardware to cost effectively detect and filter massive (100's of Gbit/s) DDoS attacks. Note: Northbound Networks Zodiac GX is an inexpensive gigabit switch that provides a convenient way to transition from an emulated Mininet environment to a physical network handling real traffic. I am facing a problem with the ryu.js script while running. Hi, Please could you follow my issue above, I am using the right command but I am getting IO exception while running ryu.js! You need to start RYU (with ryu.app.ofctl_rest) before you start sFlow-RT (with the ryu.js). The IO exception looks like a failed http request to the RYU rest API because RYU wasn't running.